There's an old saying from the bowels of the Beltway bureaucracy: "Screw up, move up." Rewarding failure is an immutable trait of the bipartisan Washington political culture. Just ask Barack Obama's Treasury Secretary nominee Tim Geithner and the Senate Republicans who are blindly standing by him. The Senate Finance Committee revealed this week that Geithner failed to pay some $43,000 in federal self-employment taxes for four separate years -- and only coughed up the remaining $26,000 of that debt when he was named Obama's Treasury Secretary-designate in November. The brilliant and meticulous Geithner didn't catch the lapses. The Internal Revenue Service and Team Obama's vetters did. Recall that Joe the Plumber, an average guy with no Ivy League degrees in business or finance, was crucified for his $1,182.98 Ohio tax lien (the state had sent a notification to a prior residence he had vacated). One might give a common man some leeway for making common mistakes. But Geithner is no "common" man -- and "$43,000 in unpaid taxes is a common occurrence" simply does not wash as a credible alibi. 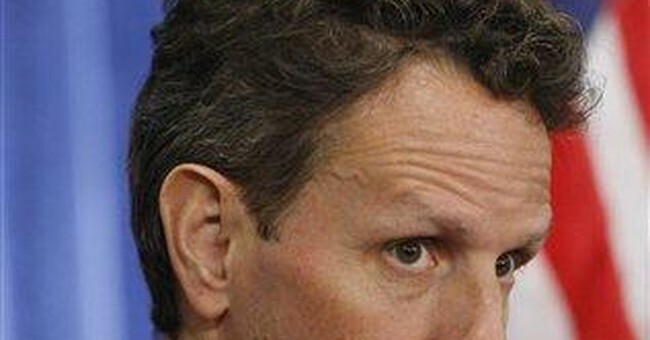 Supporters have dubbed Geithner "too big to fail." Try "too smart to care." Geithner is the Dartmouth- and Johns Hopkins-educated president of the New York Federal Reserve Bank who, according to his extensive biography, has also "studied Japanese and Chinese, and has lived in East Africa, India, Thailand, China and Japan." Apparently, he has been too engrossed in his foreign language studies and too busy traveling abroad to pay attention to crossing the t's and dotting the i's of his household records. In addition to his failure to pay four years' worth of federal taxes (you try getting away with that without getting thrown behind bars! ), Geithner also illegally employed an immigrant maid for three months after her work authorization papers had expired. Employees also proactively file an Annual Tax Allowance Request promising to "pay the taxes for which I have received tax allowance payments." The Senate Finance Committee released one of those forms signed by Geithner. A Senate source confirmed to National Review's Byron York that Geithner pocketed the cash: "He was getting the money. He was being paid a tax allowance to pay him for tax payments that he should have made but had not." IRS employment application packets notify potential workers that the Treasury Inspector General for Tax Administration vets all candidates and current employees "who have violated or are violating laws, rules or regulations related to the performance of their duties." President-elect Obama is standing by a nominee who would oversee the IRS but might not even qualify for a lesser job at the agency. This is insanity. Obama spokesman Robert Gibbs calls Geithner's transgressions "honest mistakes." Media outlets like the Associated Press have attempted to downplay his snubbing of the law as mere "tax goofs." When Democrats like Geithner, Al Franken and Charlie Rangel fail to pay up what they legally owe, they're just goofs. When you or I object to forking over more than what we're already paying, Vice President Joe Biden calls us unpatriotic. Even more maddeningly, Senate Republicans Orrin Hatch and Lindsay Graham insist on defending Geithner as "very competent" and "the right guy." Never mind Geithner's atrocious role in fostering the spending binge of financial giant Citigroup and engineering the teetering company's $52 billion federal bailout. Those who take his tax evasion and record of failure seriously are guilty of "think[ing] in small political terms," Graham lectured. Tell that to the millions of self-employed entrepreneurs across the country who sweat bullets paying their quarterlies and ensuring their papers are in order down to the hundredth decimal place. It's fecklessness like this that has earned Washington Republicans the "Stupid Party" moniker. Screw up, move up: It's the Washington way.